My lovely friend Lisa was staying with me this week! I originally met her in a facebook group I was a part of, where we bonded over our love of all things sweet, and just food in general. We then somehow managed to become part of the best girlboss gang ever, the Sugar Hoes, comprised of both of us, and our friend Bets, who runs a badass cake shop and sweet cafe in Auckland! (They have some of our clouds there, making it the coolest cafe in NZ) Lisa is an incredible pastry chef, and it also happened to be her birthday while she was staying! So of course, cake was a must. I must admit that I secretly felt a huge amount of pressure making a pastry chef a birthday cake, but at the end of the day I ended up roping her into helping me so everyone won! I recently (I am aware that I am a good four years late to the party) got the Milk bar cook book, and after a failed attempt at getting peaches from the farmers market for a cake for Lisa, we ended up with a bag of apples, and this book open on the table. I had been wanting to try making something from the book for a while, but was low key intimidated by the aspect of acetate within the cake rings to help hold everything together, so figured there was no better time than when I had a trained eye helping me! The Apple pie cake has what feels like a zillion components to it - A brown butter cake which is cooked in a sheet pan, a cider soak to help keep the cake moist, liquid cheesecake (barely cooked cheesecake mixture), pie crumbs, then an apple pie filling. 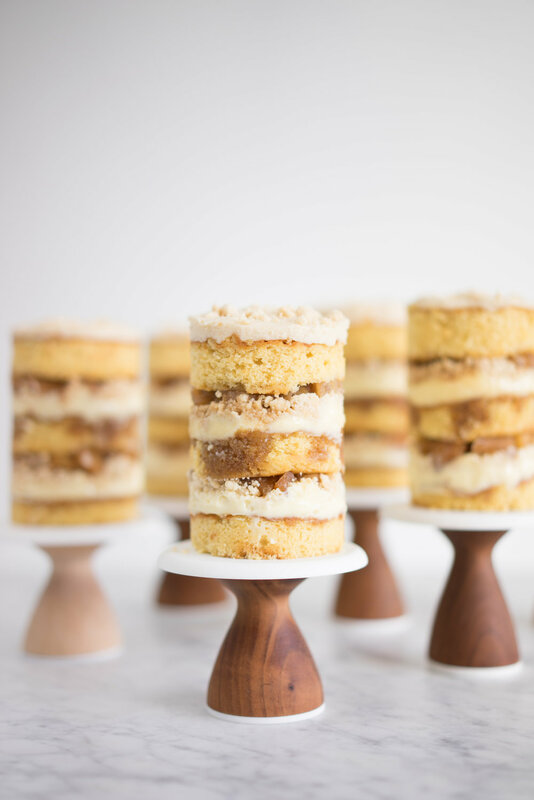 You then rinse and repeat this three times until you have a super complex looking wee stack, then top it off with some buttercream which has blitzed pie crumbs in it! What a mouthful (quite literally). The resulting cake however, is nothing short of amazing. 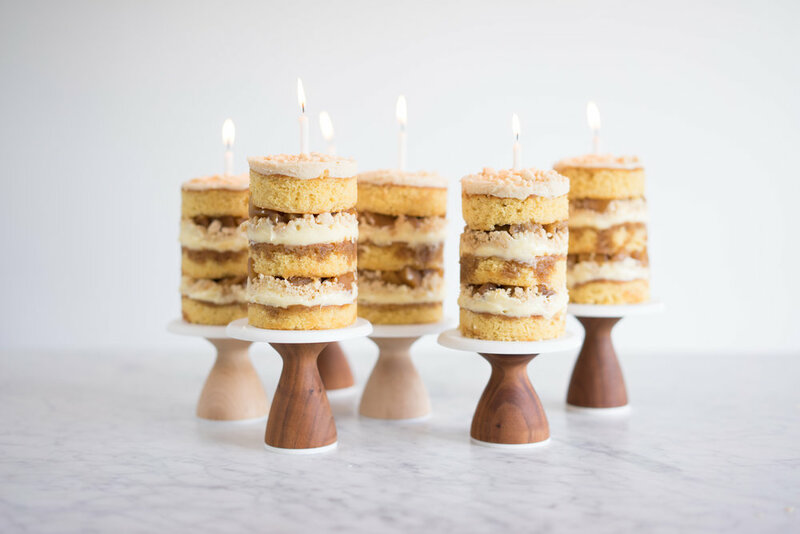 Everything ties together perfectly, and we ended up making six miniature 3 inch cakes rather than one six inch like the recipe, and OH MY they are too cute!! I used six three inch cake rings which we lined with strips of acetate. You layer all of the things in the lined rings, then pop them in the freezer for about 12 hours, peel off the acetate, and you have the prettiest layer cake ever! I love that you can see all of the individual components up the side! I pretty much followed the recipe from the book, except I skipped the apple cider soak, and in it's place used reduced cooking liquid from the apple pie filling component, thinned out with a little apple cider. I would also highly recommend making the pie crumb with brown butter - it gives it an amazing nutty taste which ties in well with the cake flavour. Because this recipe is very component heavy, and there is also a freezing time in there (which helps to make the acetate removal nice and tidy), this is definitely something you are going to want to make the day before, and assemble the evening before you need it, so that it has time to freeze. I ended up doubling the recipe in the book to give me six teeny baby cakes, so this recipe will make two six inch cakes, or six three inch cakes. I would definitely halve it (the original recipe) if you are making just the one six inch cake - these are super sweet, and I still have three in my freezer I am slowly giving to people! With that being said, it doesn't actually take much longer to make double the recipe, and this keeps well in the freezer, so you can definitely have some now and save some for another time! I had a fair bit of cake scraps leftover, but they are sitting in my fridge next to the leftover buttercream, ready to be made into cake pops! One more thing - this is the sort of recipe where if you don't use a kitchen scale, now is the time to start. I am a huge fan of working in grams (Partially/extremely biased as I grew up using them and my brain is having a hard time changing over), because they give you a level of accuracy that you can't get with cups - everyone scoops a different sized cup of flour so grams help keep it all consistent. Preheat the oven to 350f/180c. Spray a half sheet baking tray (18 x 13 inches) with baking spray. Brown the butter by melting over medium heat, then continuing to cook until light brown and nutty smelling. Remove from heat and allow to cool. In the bowl of a stand mixer fitted with the paddle attachment, combine the butter, brown butter and sugars. Beat on high for approximately 5 minutes, until fluffy. Add the eggs one at a time, mixing well after each addition, and scraping the bowl down as needed. Mix for 2-3 minutes until homogenous. With the mixer on low, slowly add the buttermilk, oil and vanilla. Mix on medium for approximately 10 minutes, until the mixture has come together uniformly. This step may take up to 15 minutes. Scrape the bowl down well. Add the flour, baking powder and salt, and mix until just combined, scraping the bowl down well and mixing for another 20 seconds to ensure even distribution of the dry ingredients. Spread the mixture into the sheet pan, and smooth with a spoon or spatula. Bake for 30 to 35 minutes, checking for doneness after 30 minutes. The cake will be golden brown and the edges will spring back when lightly touched. Ensure that the middle is not jiggly. Remove from the oven and cool completely. Cover with plastic wrap until ready to use. In the bowl of a mixer fitted with the paddle attachment, mix the cream cheese on medium speed for 3 minutes, until smooth. Add the sugar and mix until well combined, scraping down the bowl well. In a small bowl, measure out the corn starch and salt. Slowly whisk the milk into the corn starch, ensuring that there are no lumps. Add the eggs and mix well. With the mixer running, slowly add the milk and egg mixture to the cream cheese. Mix for 5 minutes until smooth. Spread into a glass oven dish or loaf pan, and bake for 15 minutes, or until the outside edges of the cheesecake are just firm, and the centre is still jiggly. Continue to cook in 5 minute increments if it is not yet at that stage. Remove from the oven and cool, then use an immersion blender or blender to blend the mix until homogenous and uniform in texture. Store in the fridge until ready to use. Preheat the oven to 350f/180c. Line a baking tray with silpat or parchment paper. In the bowl of a stand mixer fitted with the paddle attachment, combine the flour, sugar and salt until well mixed. Add the butter and water and mix on low until clustered. Fill a bowl with water, and juice the lemon into it. Peel, core and quarter the apples. Dice each quarter into small pieces (cut into quarters lengthways, then each quarter into quarters, leaving you with 16 pieces per quarter). Transfer apple to the bowl of lemon water as you go. Drain the apples, and add to a medium pan. Add the brown sugar, butter, cinnamon and salt, and cook on medium heat, stirring occasionally, for 3-5 minutes. The apples will release liquid and begin to cook down. When the apples are fork tender, remove from the cooking liquid with a slotted spoon. Cool and refrigerate until ready to use. Make the cake soak with the remaining cooking liquid. Using the liquid left from the apple, heat over medium heat. Cook for 5 minutes, swirling the pan often, until the mixture has reduced and thickened slightly. Add apple cider and mix until incorporated. Alternatively you can skip the reducing step and use the liquid as is, omitting the apple cider. Add milk and pie crumb to a blender. Mix on high for 2-3 minutes, until a smooth paste consistency is reached. In the bowl of a stand mixer, mix the butter and icing sugar on high until smooth and pale. Scrape down the sides, and add the pie crumb paste. mix well on high for 2-3 minutes, scraping down the bowl as needed, until the frosting is pale and uniform. If the consistency is too runny, add more icing sugar as needed, and mix well. Transfer to an airtight container and store in the fridge until ready to use. Using the cake ring or a three inch cookie cutter, cut circles from the sheet pan. You need 18 in total (six cakes at three layers each). You may not get 18 full circles cut out, but you can use scraps pushed together to form the bottom layers of some of the cakes to make up the total cake layers to 18. Place a circle of cake in the bottom of each cake ring, pushing down to make sure it is sitting flat. If you need to make up cake circle numbers now is the time - push scraps into the bottom of the rings to form the bottom layer. Using a pastry brush or spoon, gently brush or spoon over some of the cake soak, until the top of the cake layer is moist. Divide half of the liquid cheesecake between the rings. Use the back of a spoon to smooth it down. Sprinkle a layer of pie crumb over the cheesecake filling, pressing down well with your hands to ensure that they are in place. Divide half of the pie filling between the cakes. Repeat the same process as layer one. Finish off each cake with the final cake circle. Spread the top of each cake with the pie crumb frosting, and decorate with extra pie crumbs. Freeze the cakes for at least 12 hours, to allow all of the filling layers to set. Three hours before you are ready to serve, remove them from the freezer, pop them out of the cake rings, and carefully peel away the acetate layers to reveal the cake inside. Transfer to a serving platter, and allow to defrost before serving. Leftovers can be wrapped in plastic, and frozen or kept in the fridge.